Money and work motivate people to move and people are sometimes more mobile than we think-especially if opportunities were limited in the area where the person was living. Create a timeline of all events in your ancestor’s life. Gaps of more than a few years are opportunities for research. Lots of things can happen in two or three years. Do you really know what you think you know? How do you know it? Did you assume when you should not have? Do you know where that source came from? Are you familiar with all sources in the area–civil (all levels of government) and private records? 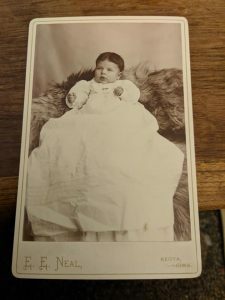 Have You Rescued a Photograph? Just make certain you have correctly identified the person. The image in this post had a name written on the back and a location of the photographer’s city on the front. How to “Use” that Old Genealogy? 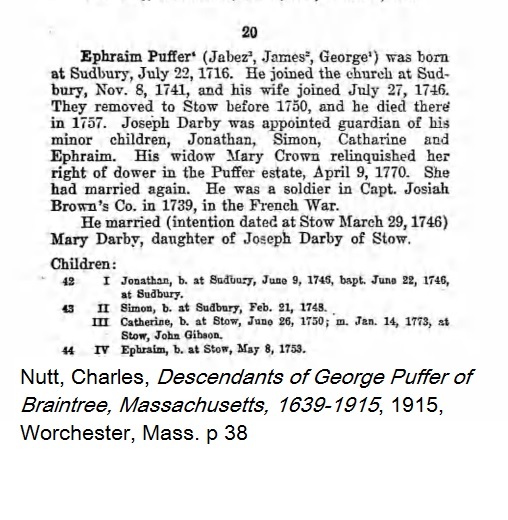 We can’t really cover analyzing “old published genealogies” in one tip, but there are some suggested ways for using information printed in genealogies published in the early twentieth century and earlier. Don’t copy every statement directly into your records because “it has to be correct because it is in print.” It doesn’t. When specific dates or events are given, think about what records might have been created as the result of that event. Locate those records. The author may or may not have accessed those records. Access was significantly different when the book was compiled than it is today. For events that are within fifty years of the book’s publication, consider the possibility that someone with primary knowledge of that event (or even contemporary secondary knowledge) communicated with the author. Note: just because this communication is possible does not mean that it happened. Information on events outside the lifetime of the author are more likely to have been “handed down” or copied from other material. Look and see if more recent scholarship on the family has been published. There’s more to the analysis than this, but keeping these points in mind is an excellent start. Did They Ever Get Married? I knew my aunt had at least three children in the 1840s in Germany with a man that I assumed was her husband. Turned out he was the father of her children, but that they were not married when some of the older children were born. Because of their parents’ marital status, some of the children used her maiden name as their last name, some used his last name as their last name, and some went back and forth between their parents’ last names. It took me forever to locate one of the daughter’s marriage record as she married under her mother’s maiden name and not the last name of her father. Do You Remove Distractions to Focus? 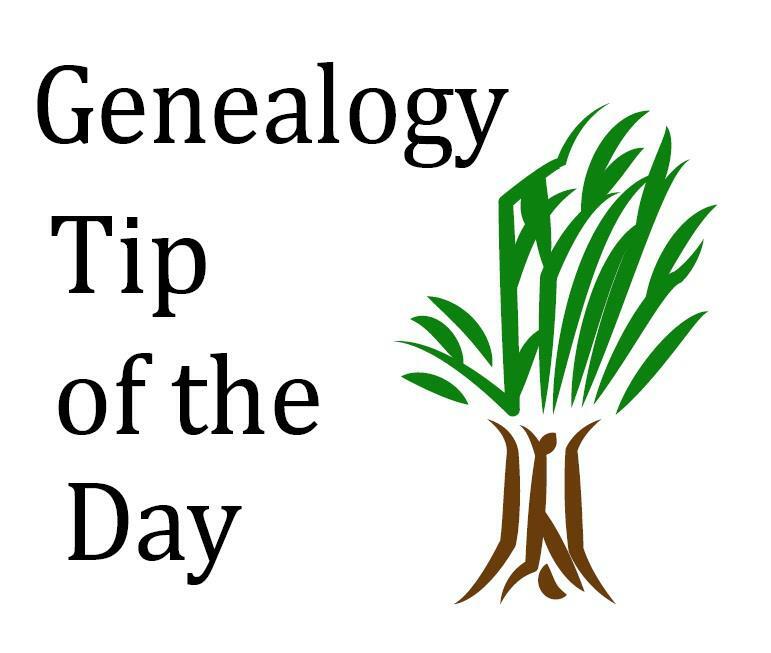 It’s not necessarily genealogy advice, but sometimes in order to really process information and understand something, one need to be able to concentrate. Turn off the television, close those open browser windows, turn off the email/text alerts, etc. Really focus and concentrate on what you are attempting to analyze and understand. 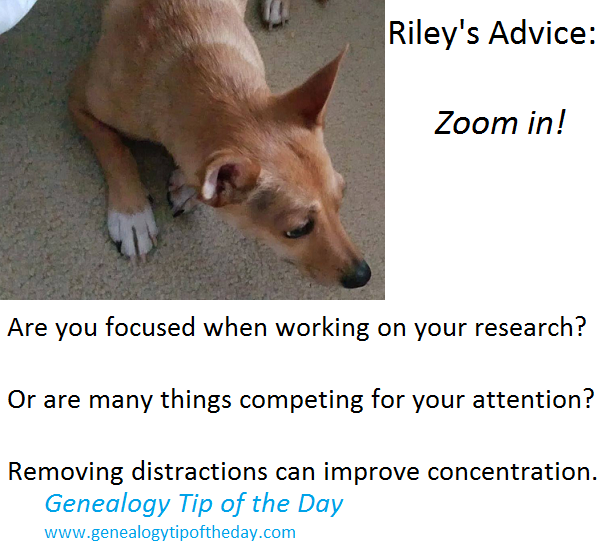 It may not be possible to “tune it all out” and focus as intently as Riley is in the illustration, but sometimes making an attempt to remove distractions can really help. And researching three families at the exact same time only leads to confusion. Nancy’s husband died leaving no will. Nancy and all her children owned the farm jointly. Nancy wanted to sell the farm and move to town. The only problem was her youngest son was a minor and unable to sign of his own accord. Consequently Nancy and the youngest minor child had to sue the rest of the family. It was the only recourse they had due to his age. Place names may not be spelled correctly, but Limvady was close enough for me to locate the actual location. Time to Hit the Clutch and Shift? Are you spending much time looking for a specific record that might not really even help your research all that much? There’s a couple for whom I cannot find their mid-1800 passenger list entry. After some thought, I’m not really certain how much more time I should spend looking for it. I have a good idea of where the family is from in Europe as I know where the husband’s brother was born. I know what children the couple had and where they settled. The mid-1800 passenger list probably isn’t going to tell me where they were from. And after having spent nearly ten hours trying to find them, it may be best to work on locating other records. Sometimes it is necessary to realize that it may be time to work on other things. I have kept track of the name variants I have used, the databases I have queried, when my searches were conducted, and all the search parameters I entered. That’s a key part of the search when someone cannot be located easily and quickly. I would love to find their passenger list record and would certainly look at it if someone located it. But sometimes one has to move on and search for something else. I can always try and look for it again later and it’s possible that something in some other record helps me to find it. 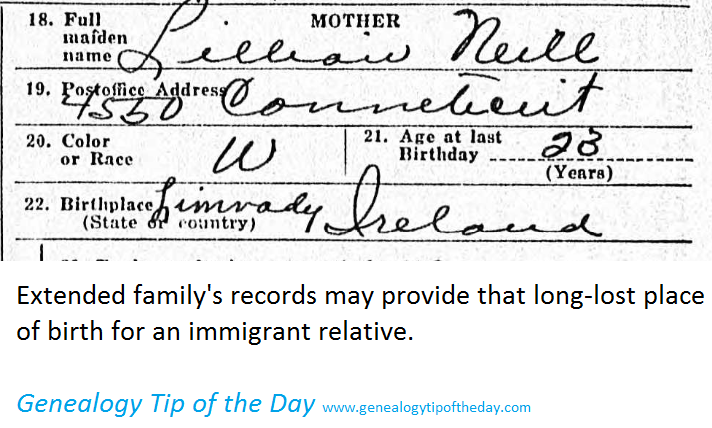 If your family lived in one small area for centuries, you may discover that you have “repeat” ancestors, people from whom you descend more than once. Of course for this to happen, cousins have to marry. But husband and wife couples who are related to each other may have had no idea of their relationship, particularly if it was distant. 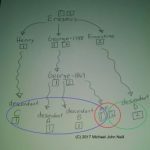 Charting out these relationships may be helpful to see the connection, but most genealogical software packages don’t easily allow such relationships to be diagrammed easily–paper and pencil is my personal favorite for drafting these charts as can be seen in our longer blog post. Those with relatives in the United States may find the historical maps on the United States Geological Survey helpful in their research. Generally from the 20th century, these maps contain place names including schools and cemeteries. A map created fifty years after your ancestor left an area could still provide a detail significant to your research problem. View the map site or our post on accessing them.